Copier Paper - A4 White - 5 Reams Pack of 5 An everyday reliable and sustainable paper for volume printing and copying at home or in the office. Guaranteed for use on colour & mono inkjet and laser machines. 5 Reams per box. Copier Paper - A4 WB - 5 Reams Pack of 5 An everyday reliable and sustainable paper for volume printing and copying at home or in the office. Guaranteed for use on colour & mono inkjet and laser machines. 5 Reams per box. Team Copier Paper 80gsm - Box 2500 Sheets Pack of 5 Team Copier Paper is the dependable paper for everyday office requirements. Ideal for black/white laser, black/white inkjet, black/white copies and FAX. Colour: white, A4 80gsm. 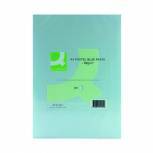 Image Business FSC4 Laser Paper A4 90gsm White Pack 500 Pack of 1 HP Printing Paper. Multifunctional paper for laser and inkjet printers, copiers and fax machines. Provides ideal brightness and smoothness for clear, sharp print. Features Colourok technology for rapid ink drying time and vivid results. 90gsm. Size: A4. Q-Connect Yellow Coloured A4 Copier Paper 80gsm Ream (Pack of 500) KF01096 Pack of 1 Q-Connect Coloured A4 Copier Paper. High quality 80gsm coloured copier paper ideal for copying and laser printing. Each ream is individually wrapped in clear packaging for ease of colour identification. Size: A4. Colour - Yellow. 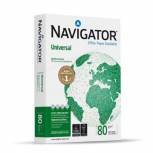 Navigator Universal A4 Paper 80gsm White (Pack of 2500) NAVA480 Pack of 5 Navigator Universal Paper A4 80gsm White Ream NAVA480.A multifunctional paper for use with all mono and colour office equipment. Superior smooth surface for improved print quality and reduced office machine downtime. Q-Connect Pink Coloured A4 Copier Paper 80gsm Ream (Pack of 500) Pack of 1 Q-Connect Coloured A4 Copier Paper. High quality 80gsm coloured copier paper ideal for copying and laser printing. Each ream is individually wrapped in clear packaging for ease of colour identification. Size: A4. Colour - Pink. Q-Connect Green A4 Copier Paper 80gsm (Pack of 500) KF01093 Pack of 1 Q-Connect Coloured A4 Copier Paper. High quality 80gsm coloured copier paper ideal for copying and laser printing. Each ream is individually wrapped in clear packaging for ease of colour identification. Size: A4. Colour - Green. Q-Connect Blue Coloured A4 Copier Paper 80gsm Ream (Pack of 500) Pack of 1 Q-Connect Coloured A4 Copier Paper. High quality 80gsm coloured copier paper ideal for copying and laser printing. Each ream is individually wrapped in clear packaging for ease of colour identification. Size: A4. Colour - Blue. HP White Office A4 Paper 80gsm (Pack of 2500) HP F0317 Pack of 5 A high performance office paper designed for high volume copying and printing. Compatible with all laser printers, copiers and fax machines. Designed to keep printers clean by removing microscopic dust particles. A4 80gsm. White. 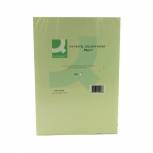 Discovery A4 70gsm White Paper (Pack of 2500) 59912 Pack of 5 Discovery A4 Paper. Ideal for use in copier and laser machines. Sourced from responsibly managed forests. 70gsm. Colour: White. Pack of 2500. Color Copy A4 Paper 100gsm White (Pack of 500) CCW0324 Pack of 1 Color copy - the best sheet on the market today for colour copying. Ideal for low, medium and high volume production on colour copiers and colour laser printers. A4 100gsm. Q-Connect Bright Red Coloured A4 Copier Paper 80gsm Ream (Pack of 500) Pack of 1 Q-Connect Coloured A4 Copier Paper. High quality 80gsm coloured copier paper ideal for copying and laser printing. Each ream is individually wrapped in clear packaging for ease of colour identification. Size: A4. Colour - Bright Red. Q-Connect Bright Yellow Coloured A4 Copier Paper 80gsm Ream (Pack of 500) Pack of 1 Q-Connect Coloured A4 Copier Paper. High quality 80gsm coloured copier paper ideal for copying and laser printing. Each ream is individually wrapped in clear packaging for ease of colour identification. Size: A4. Colour - Bright Yellow. Image Business A4 80gsm 5 x 500 sheets (FSC Accredited) Pack of 5 - Multipurpose paper - FSC® certified - Reliable - Duplex printing - High volume print runs - Laser guaranteed, spot colour - Inkjet guaranteed, spot colour Multi-functional uncoated copier paper, Bright white, woodfree, ECF.